Dom and Brian at it yet again. My Fast and Furious marathon (albeit having skipped Tokyo Drift) comes full circle with 2011’s Fast Five. Fast Five picks up exactly where Fast 4 left off as Brian O’Conner (Paul Walker) and Mia Toretto (Jordana Brewster) break Dom (Vin Diesel) out of prison, and the three of them go on the run, living a life of crime again. Soon enough, in an attempt to rob a train, Brian, Mia, and Dom cross a powerful Brazilian drug lord, which leads them to getting framed for the murder of three DEA agents. As our heroes embark on their quest for revenge, DSS Agent Hobbs (Dwayne “The Rock” Johnson) goes hot on their tail. 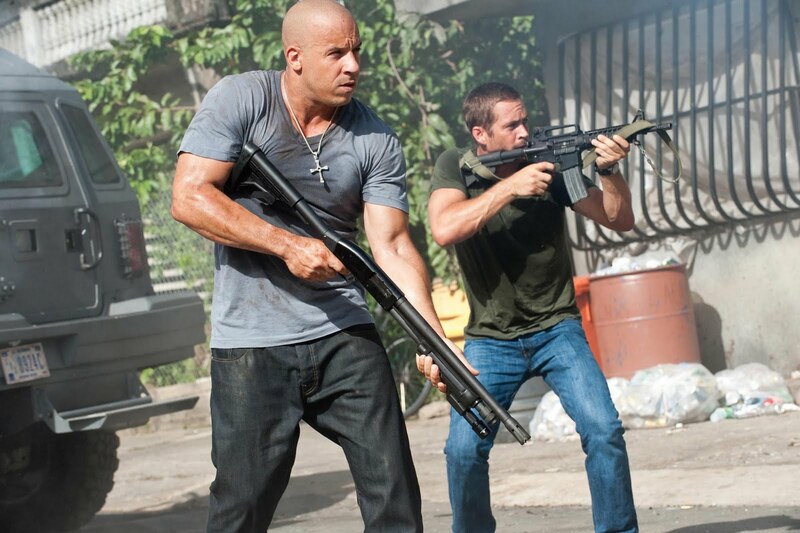 Like all the movies before it, as well as Fast 6, Fast Five is basically teen male escapist fantasy. Even when basically the entire city of Rio de Janeiro was out to kill them, the leading characters have no qualms about holding street races, complete with scantily-clad women. If I were in that situation, I would think drawing attention to myself is the last thing I would want to do. Of course, this is a movie where you have a character cheering on the PA of a stolen police car. While it was less so than Fast 1 or 2, the plot in Fast Five was rather painfully stitched into the rest of the movie. Hobbs was the only character to have anything that vaguely resembled an arc. Dom got over Letty’s death disturbingly quickly, even if she were awkwardly return the next movie (which of course nullified the entire plot of Fast 4). That said, I once again praise Justin Lin’s direction of the car sequences, especially the climactic one. We see Dom and Brian in Dodge Chargers dragging what will henceforth be known as the Box of MacGuffin through the streets of Rio as the entire police force is chasing them. I (unsuccessfully) tried to avoid thinking about all the dead people Dom and Brian left in their wake (including at least one cop I think got decapitated by steel cable) as I was awed by the scene’s choreography and camera angles. It also helped that Rio was a hell of a pretty city. Of course, the mechanical engineer side of me was still bothered by the fact that I think dragging the Box of MacGuffin would only result in Dom’s and Brian’s cars having their rear sections torn off. Then again, this is the movie where characters succeeded in getting a guy’s handprint off a bikini in order to open said Box of MacGuffin, so it’s possible they developed some indestructible composite while they were at it. I wonder what movies would be like if more moviegoers had a better knowledge of physics. Nonetheless, I can see why Fast Five is considered the best of the series. The Fast and Furious series always set out to be mindless fun, and Fast Five was the most enjoyable mindless fun the series had to offer. Still my favourite in the series, just for the action being brilliant – but not ridiculous (like the flying in F6). I could watch the safe scene all day and never get bored. That bit when Vin leans over and picks up The Rock with a ‘Bro Shake’… probably the most manly thing that’s ever been filmed. At any rate, I think it’s the manliest thing to have been filmed in life after the era of classic Arnold Schwarzenegger action. I’m tempted to watch Fast 6 again to see how it stacks up against the rest of the series. I saw that movie first, and then went back and started watching the series (except Toyko Drift) to see what led up to it.